We’d love your help. Let us know what’s wrong with this preview of All Things Bright and Strange by James Markert. The people of Bellhaven have always looked to Ellsworth Newberry for guidance, but after losing his wife and his future In the wake of World War I in the small, Southern town of Bellhaven, South Carolina, the town folk believe they’ve found a little slice of heaven in a mysterious chapel in the woods. But they soon realize that evil can come in the most beautiful of forms. To ask other readers questions about All Things Bright and Strange, please sign up. I didn't realize it when I picked this up, but I heard it's Christian fiction. Do you have to be Christian to appreciate this book? And is it scary? However, I do read a lot fantasy, science fiction & historical fiction that has incorporated Judaism, Islamic culture, Shinto & various indigenous cultures & religions & have had no problems with those books (if anything, it brings context to characters’ intentions & world building. James Markert serenaded me with the vernacular of country folk of the Deep South. Post World War 1. Enter the days of prohibition and bootlegging. Words danced off their lips with a Southern Charm that filled me with a longing for the times. The prose flowed across the pages like a gentle stream. It held me mesmerized. I was alive and kickin' in the quiet town of Bellhaven, South Carolina. Kindly pass the bowl of hoppin' John. Mighty glad to be there. From the outset, the characters were exquisi James Markert serenaded me with the vernacular of country folk of the Deep South. Post World War 1. Enter the days of prohibition and bootlegging. Words danced off their lips with a Southern Charm that filled me with a longing for the times. The prose flowed across the pages like a gentle stream. It held me mesmerized. I was alive and kickin' in the quiet town of Bellhaven, South Carolina. Kindly pass the bowl of hoppin' John. Mighty glad to be there. From the outset, the characters were exquisitely drawn in striking detail. What an uplifting pleasure. World War 1 veteran Ellsworth Newberry returned to his hometown. Bellhaven. Anyway, most of him did. His left leg remained in France complements of a German mortar round. As if things weren't bad enough, his wife Eliza had perished in a fire just before his departure for the war. At the time, it seemed like the patriotic thing to do. Now, not so much. Bitter and broken, Ellsworth struggles through life from day to day. All his reasons to live - gone. Kept a pistol close at hand. Only needed one bullet. Word got around about a hidden Chapel in the woods. Within walking distance nestled just outside of town. Everyone was inescapably drawn to it. Moths to the light. Townsfolk claimed it held some kind of mystical, spiritual power. Everyone who entered came under its entrancing spell one way or another. Some could get in touch with loved ones long deceased. Others would find a healing inner peace. A different experience for everyone. Many visited the site everyday. Might this have been too much of a good thing? Change was in the air. Not the kind anyone could possibly prepare for. I highly enjoyed this read! Not only is it based it South Carolina and I am a South Carolinian, it was very mysterious and sinister! I loved the way the characters interacted with each other and the overall characterisation. The only thing I wish was a tad different was it was slow in the beginning. I loved the mixed elements of this story as well. The mystery was highly enjoyable, making this book a suspenseful ride I am glad I didn’t miss out on! It was honestly very difficult to give this book a 2.5star rating (rounded up to 3) because it started from a solid 5 yet somehow things went wrong along the way. The premise is very intriguing; a mysterious chapel in the woods lures people in from the nearby town with making them able to hear the voices of their dead loved ones. Yet as people go more and more they start to change for the worse so we can suspect the working of some kind of evil. There are a diverse set of characters in the novel, It was honestly very difficult to give this book a 2.5star rating (rounded up to 3) because it started from a solid 5 yet somehow things went wrong along the way. There are a diverse set of characters in the novel, the most outstanding being a WW I. veteran named Ellsworth who always takes matters in his hand and the town folk look at him as a leader. We get to know his friends, the widow of his best friend, a strange black boy, a mysterious man who arrives to take over the mansion on the hill and a whole bunch of other characters. This is one of the problems of the book, with its 300 something pages it is too short to carry so much characters. We barely get to know them. Markert delivers a unique writing style and eerie mood till the end of the first half of the book building up a truly interesting history the second part falls short of delivering clever answers. I was disappointed to find a heap of cliche in the end and felt like a good opportunity has been wasted. Overall it's a nicely written book that fails to live up to expectations after a promise of a good story. I kept feeling like it wasn't worth the hassle to drag me through so much buildup and so many characters to find a cringe worthy ending. Additionally I never got to find out the intention behind the title. Ellsworth Newberry is the unofficial leader of a small, southern town of Bellhaven, South Carolina. But having returned from war disabled, he just wants to hide in his house and forget the world. Then they find a mysterious chapel in the woods and evil 'comes in all forms'. The story was all over the place, choppy and difficult to follow. I couldn't get a grasp on any of the characters. I'm not sure what to say about All Things Bright and Strange that wouldn't sound uber critical. Sometimes it's best to simply say "It's not my cup of tea," and leave it be. STRANGE, in the vein of quirky or fantastical or eccentrically bizarre can be quite entertaining and fun. I enjoy a fanciful romp into the weird zone, from time to time. But the STRANGENESS of this novel is more in line with what I call an octopus story: An overreaching story that lacks cohesive focus, with to I'm not sure what to say about All Things Bright and Strange that wouldn't sound uber critical. Sometimes it's best to simply say "It's not my cup of tea," and leave it be. STRANGE, in the vein of quirky or fantastical or eccentrically bizarre can be quite entertaining and fun. I enjoy a fanciful romp into the weird zone, from time to time. But the STRANGENESS of this novel is more in line with what I call an octopus story: An overreaching story that lacks cohesive focus, with too many tentacles spiraling into too many directions. The beginning was good. Southernly quirky. There were some great laugh aloud moments and eccentric characters. The main character, a young widower and WWI veteran, was a hoot. However, rather than coming across as being a young man, he put me in mind of a grumpy old coot. As did his gun toting "mustard gas" friend. But that could just be my interpretation amiss. Yes . . . Not my cup of tea. The town of Bellhaven is damaged. Ellsworth, mentally and physically ruined by his experiences fighting on the frontline, is going to take his own life. Along with his ragtag couple of friends, Alvin and Omar, who were also injured during the war, Ellsworth lives a sad existence. Cooped up in his house he used to share with his very beloved wife, Eliza, who died in a fire a few years ago, Elsworth is drinking himself into a stupor in the hope he will forget. Ellsworth is haunted by both Eliza’s death and the horrors he saw on the frontline which he cannot erase from his memory and constantly haunt him in his everyday life. After the initial prologue, the book picks up with Ellsworth about to commit suicide. Rudely he gets interrupted by a cardinal bird, a bird the town associated with lost loved ones. We follow Ellsworth as strange happenings in the town coax him out of his house and back into town life. The woods on the border of the town have long been avoided by the townsfolk as stories of witches and evil spirits have circulated for generations. But when Rafael, a curious black lad who Eliza rescued, goes into the woods having not spoken for two years and emerges happy and talking, the town soon rediscover a chapel hidden in there where the voices of dead loved ones can be heard. The townsfolk become addicted to going into the woods to hear their loved ones but their visits feed a power that is growing stronger by the day. Divides amongst the varied religious community appear and the town inhabitants start to act without morals. Ellsworth must use his leadership skills to unite to town, put differences aside, and ultimately conquer the evil that is lurking in the woods. I generally have mixed feelings about this book. The core story was very interesting and engaging. I was gripped and excited to find out what was going to happen, but as the book progressed it seemed to regress into quite a silly shootout scene then when the spirits do emerge from the chapel, I found the demonic presences that were made up of birds to be wholly un-scary. However, as an English person I loved getting a sense of the 1920s in the South. I was also struck with how well the book empathises with the post-traumatic stress of the war veterans. Alvin who shoots his gun as a jerk reaction thinking it is the Germans coming to get him. Ellsworth who so vividly still sees the horrors he saw on the battlefield and feels the guilt that some of his friends who followed him to war never returned to Bellhaven. I also thoroughly liked the bit about the four angels uniting to defeat the evil. Um, definitely not what I was expecting from this book at all. All Things Bright and Strange feels like it has a thousand characters and about the same number of elaborated back-stories. That is why I feel this book was struggling to reach cohesion and well-rounded message. Is it a mystery? A thriller? A religious, mythical satire? I don't know and I really didn't care in the end. I didn't feel like there was any point to the story and don't get me started on the ending. People of a little town, Um, definitely not what I was expecting from this book at all. All Things Bright and Strange feels like it has a thousand characters and about the same number of elaborated back-stories. That is why I feel this book was struggling to reach cohesion and well-rounded message. Is it a mystery? A thriller? A religious, mythical satire? I don't know and I really didn't care in the end. I didn't feel like there was any point to the story and don't get me started on the ending. People of a little town, conveniently called Bellhaven, discover a chapel in the woods. This “little piece of heaven” is healing and bringing peace to everyone who goes there, but at a price. They are losing control over themselves and they become addicted to this serene feeling of happiness and connection to their lost ones. I went into this book expecting a meaningful tale about the power and deception of religion, how dangerous it can be and so on. I got an action-packed disconnected plot. Our main character Ellsworth Newberry, was depicted as a dominant and guiding figure, unofficial sheriff of Bellhaven, and he was the one who discovered the bad ways of church-goers. He lost a leg in the war, his wife passed away, so it's no wonder he is grumpy and negative. But there is a difference between a likeable grumpy old man (like Ove from now popular The Man Called Ove) and just plane Mr. Know-it-all who is rude and unkind. I didn't really buy his savior figure. Looking back over the time I spent reading this book, I get an intense feeling of dissatisfaction. Unimportant plot points; many long, slow parts where nothing happens, and even the more action-filled parts were not particularly interesting. Also, there was a confusing, probably symbolic-like number of birds that were mentioned, but I didn't feel like thinking about it. I'm not going to try to knock out a synopsis of this book. There's a lot, and it's both complicated and very simple; there are holes in the plot, and predictability, but also genuine creepy horror elements and interesting characterization. Note: If you're a Yankee like myself, it may help you in reading this book to know that Hoppin’ John is a dish made with black-eyed peas, smoked ham, and rice. Sounds good. Now that you know the details, you might end up very very hungry by the end of the stor I'm not going to try to knock out a synopsis of this book. There's a lot, and it's both complicated and very simple; there are holes in the plot, and predictability, but also genuine creepy horror elements and interesting characterization. Note: If you're a Yankee like myself, it may help you in reading this book to know that Hoppin’ John is a dish made with black-eyed peas, smoked ham, and rice. Sounds good. Now that you know the details, you might end up very very hungry by the end of the story, because one character is famous for her Hoppin' John, and makes it a lot. There's also a lot of alcohol flowing through this book, Prohibition or no Prohibition. The characters have all had to live through WWI, after all, either on the home front or the actual front, and none of the soldiers came back unscathed. It's realistic, and well-told, the alcoholism and the fight against it, or the surrender to it. My complaint about this aspect of the book is the language used about it. "You’ve been dipping the bill in too much giggle juice"… Over and over, in deadly serious contexts, with no levity whatever, characters referred to booze as "giggle juice". I have no idea how dialectically accurate it was – but I found it irritating, especially in light of all the other little regional euphemisms that kept cropping up – "jingle-brained" was one that was perhaps over-used. When a woman's "getaway sticks" were referred to, it took me a couple of pages to figure out that that meant "legs". And the desire to go up to someone and "drygulch him in the noodle", while not as puzzling, still made me go "huh?". Even the more common language felt out of place; I don't know if the author was working to avoid curse words, but in at least one place a character was speaking angrily about something he had every reason to be angry about, but still said "darn". So, basically, the language drove me a bit crazy (and that's not even including the one character who adopted a pseudo- manner of speaking which looked like nothing I've ever seen before). But I have to say what was said was memorable. There are images from this book that will stay with me for a while – beautiful and wondrous things, like a flock of cardinals in the form of a man, and a town with all of the trees and flowers blooming at once … and terrible, unsettling things, like a deer ramming its head into a tree, over and over, and like people – and animals – walking backwards … that made the hair stand up on my arms just typing that out. But, as mentioned, there was a sort of tedious predictability to it all. I kept hoping the plot would take a turn and do something amazing – but while the climax of the story was overall satisfying, it could have been so much more. Everything felt like it was building up to something huge and heart-rending … and I was just left a bit flat. I felt like there were major missed opportunities. But I finally found out why live oaks are called that: "That’s ’cause they hold on to their leaves nearly all year like an evergreen." Hey, thanks. I received an e-ARC of All Things Bright and Strange by James Markert from NetGalley and the publishers in exchange for an honest review. With a stunning plot and a really ethereal feel to the writing, All Things Bright and Strange really aces it in the writing aspect. The first thing that struck me as interesting about the book was that it really made me understand the effect of war on people, as it is set in a time of wars. Don’t get me wrong – I’m not a monster who doesn’t know how horrifi I received an e-ARC of All Things Bright and Strange by James Markert from NetGalley and the publishers in exchange for an honest review. With a stunning plot and a really ethereal feel to the writing, All Things Bright and Strange really aces it in the writing aspect. The first thing that struck me as interesting about the book was that it really made me understand the effect of war on people, as it is set in a time of wars. Don’t get me wrong – I’m not a monster who doesn’t know how horrific war is. Its just that the book made it seem so real and so painful and I really did sympathize with the war veterans described in the book. As for the supernatural side, I did find the description of the conflict between the religious leaders of the town slightly strange, but other than that the descriptions of the “magical chapel” and its effect on the town were magnificent. The whole concept of a town driven to madness because of “supernatural occurrences” was fantastically done. As a character, Ellsworth contributed well to the story but he wasn’t really my favorite protagonist in the beginning of the book. I found his story slightly hard to follow towards the beginning and I do wish more was explained about his wife Eliza. "It was as good a day to die as any." Ellsworth Newberry has lost his desire to live; he lost one of his legs in the war, he lost his beautiful wife in a town tragedy before he enlisted, and now he is contemplating losing his soul with the simple click of a trigger. But it wasn't meant to be. Strange things are happening in the small town of Bellhaven, South Carolina and they all revolve around a chapel; a chapel deep within woods rumored to be haunted; yet trips to the chapel appear to bring healing, along with conversations among loved ones long passed. Gradually, continued pilgrimages to the small edifice begin to stir the town's darkest intentions; inciting friends again friends, wives against husbands and religions against religions. For a town that once prided itself on being inclusive, a foul stench permeates its very core; the fissure among its citizens growing wider by the day. It seems that Ellsworth Newberry must rise to the occasion. This Southern gothic-like novel is extremely well written, capturing the essence of a small community during the time period, while infusing an almost apocalyptic sense of impending doom, save for the efforts of those whose destiny is to guard and protect. Lest we sink to the same depths as Bellhaven, may we follow the advice of the author when he writes, "it's time focus to again on what brings us together instead of what could tear us apart". "The beauty of the Bellhaven woods was like a desert mirage - an optical phenomenon inviting trouble, an illusion of light rays that disguised the truth." There is just something about the cover that immediately intrigued me, and this book has been on my radar ever since I first heard about it. After I finished another book by the same author, What Blooms From Dust, I just knew I had to read All Things Bright And Strange as soon as possible. Magical realism can kind of be a hit or miss for me depending on how the elements are developed, but I really like how James Markert incorporates them into his stories. All Things Bright And Strange is another example of how I can actually really enjoy magical realism when it's done right. The story starts out as a typical historical fiction read mostly set in the years after WWI. The main character, Ellsworth, is a WWI veteran along with several other characters, while others have lost someone during the war. I think this is probably my favorite element and the after effects of the war are very well described in the different veterans. A very important topic as well since there isn't enough awareness when it comes to what veterans are going through! Grumpy Ellsworth really grows on you and he even reminded me a bit of Fredrik Backman's Ove (HUGE compliment!). The characters in general are well developed and each plays its role in the events in Bellhaven. Some of their names even have special meanings... But that is something for you to discover as you are reading it to avoid spoiling surprises. The magical elements mix quite nicely with the historical fiction parts, and the author did a great job creating the right atmosphere for the time period. And the descriptions of the chapel in the woods are wonderful. BUT. There was way too much religious talk to my taste, and All Things Bright And Strange should be classified as Christian fiction. True, a lot of different religions are making their appearance in the story, creating diversity, but I simply feel there was too much religious talking going on and some of it sounded almost like preaching. Which is why I ended up enjoying this one less than What Blooms From Dust, but if you don't mind a healthy dose of religion in your story, you will enjoy it even better than I did. The descriptions of the strange things that are happening in Bellhaven are simply magical. The people of Bellhaven have always looked up to Ellsworth Newberry, asking for his guidance whenever problems arise in town. But after he lost his wife in the town fire and he came back from the war with his hopes for a future as a professional pitcher destroyed, he hasn't been the same old self. Then he finally sees something strange is going on in Bellhaven... A small chapel is discovered deep in the Bellhaven woods, and it seems to have mysterious healing powers. People keep returning to find peace of mind, but is the chapel really a miracle or a potential problem in disguise? A mysterious chapel in the woods draws townsfolk to it. Legend says the church has a healing floor, but the truth is the more time you spend on it, the older you get. Ellsworth, the protagonist is both enthralled by the chapel and decided to get to the bottom of the mysteries that surround it. Published 30 Jan 2018, archived 1 March 2018. Thomas Nelson. Wow, just wow! That’s what I have to say about the brilliantly amazing “All Things Bright and Strange” by James Markert. Taking place mostly in 1920, Markert’s latest novel is part historical fiction, part Southern fiction, and part supernatural and paranormal storytelling at its best. Strange things are happening in the small South Carolina town of Bellhaven. Everything, and I mean everything, is blooming at once. And the birds? They’re everywhere — especially the cardinals. But what does it mean? Townsfolk are still reeling from the after effects of World War I. Considered a “special kind of different,” Ellsworth Newberry, the unofficial leader of the town who keeps surviving tragedy after tragedy, is learning to adapt to life minus one leg, as well as the fact that his wife died in a Klan-led tragedy. Anna Belle is adjusting to being a war widow. Alfred and his wife Linda May are overcoming his war-caused blindness and drug addiction. And Omar, one of the blacks in this rare southern integrated town, must wear a mask to cover where his face once was — also thanks to the war. As more and more odd occurrences start happening in Bellhaven, including the arrival of the weird and mysterious Lou Eddington who recently purchased the historic town plantation, and the discovery of a chapel in the woods that townsfolk have always feared and avoided, Ellsworth and his chums must join forces to fight the unseen forces bent on destroying their idyllic town. Markert writes in a beautifully descriptive manner, pulling the reader right into the story’s surroundings. He projects a small-town vibe even after just a few chapters. Weaving nature and its elements and creatures throughout the entire story, he builds a gorgeous yet intriguing picture. A novel of forgiveness, racial division and spiritual warfare, “All Things Bright and Strange” delves into many deep topics — dealing with the impact and effects of war; being able to determine what’s truly good and what just appears to be good; angels and demons; trust; and coming together to fight for a common cause. It also strongly reminds us to focus on the importance of what brings us together and not apart. We must put aside our differences and then we will be invincible. The final battle scene will leave you in chills, including a scene where the birds help make the invisible visible. Fans of stories set in small Southern towns and stories that deal with racial division will enjoy “All Things Bright and Strange,” as will fans of supernatural and paranormal tales. So fans of novels like “To Kill a Mockingbird” or authors like Frank Peretti, Ted Dekker and Travis Thrasher will love Markert’s latest novel. Slight disclaimer: there are mild incidents of lustful thinking, as well as some smoking and alcohol use. I chose this book because I liked the look of the cover, I thought the title was clever and the story sounded a little bit different. All Things Bright and Strange opens in 1917. Despite the differences in race and religion, the people of Bellhaven have always got along with each other. But then a group of men wearing white robes and carrying flaming torches track a young black boy, Raphael, to the town and set fire to the town hall. Several people are killed, including Eliza Newberry, the wife o I chose this book because I liked the look of the cover, I thought the title was clever and the story sounded a little bit different. All Things Bright and Strange opens in 1917. Despite the differences in race and religion, the people of Bellhaven have always got along with each other. But then a group of men wearing white robes and carrying flaming torches track a young black boy, Raphael, to the town and set fire to the town hall. Several people are killed, including Eliza Newberry, the wife of Michael Elsworth Newberry. The strength of this story is definitely in the brilliant characters and I loved the way they interacted with each other, their old friendships shining through. The story is told by Elsworth, who has an entertaining, dry sense of humour, but I also loved Raphael, Gabriel and Anna Belle. The setting is very atmospheric and the mystery surrounding that sinister chapel kept me gripped too - until 1.00 am in the morning! However, about halfway through the book the viewpoint switches to that of several townspeople, one after the other, revealing the grudges they feel towards their neighbours, and their plans to get their own back. This went on a bit too long and I'm afraid I ended up skipping it. And the shoot-out scene didn't seem to go with the magic realism style. Apart from that, I really did enjoy this unusual story and would give it 4.5 stars, rounded up to 5. All Things Bright and Strange would appeal to fans of Stephen King (Needful Things) and Neil Gaiman (American Gods). I was lucky enough to receive an advance copy of this book, which will be published on 30th January 2017. Black and white alike, side by side, dancing together- can it be? Can Bellhaven truly be real? Ellsworth is prepared to die, ravaged by the war, broken by the loss of his wife, why shouldn’t he end things with his Smith & Wesson? Anne Belle Roper won’t let him, it seems, bringing him breakfast and the care he needs. Ellsworth is too young to feel and look so old. He will never be a professional baseball player, never be a father, never again know Eliza’s love. He puts the blame on the strange boy with no last name. There is something special about a little boy named Raphael, aside from his gifted piano playing skills. The beautiful soul has kept Anna Belle sane while the men were away at war. Cardinals are hanging around, strange things are happening, but Ellsworth can only remember the misery of his stillborn son Erik and his wife Eliza. The town is changing and if he can stop himself from committing suicide, he just might have to get to the bottom of things. Why is everything blooming? What does the once hidden chapel have to do with everything that is happening? Is the healing floor good or evil? This magical place, can it be trusted? Just who or what do you pray to there, beautiful or not, is it safe? “Beautiful don’t always mean safe, is all.” Ellsworth remembers his mother’s words. How are they talking to the dead, is it possible? The people of Bellhaven are turning to the chapel far more than they should. Ellsworth has woken from his depressed state, but can he save the people as they turn against each other? What are the secrets of the chapel? Who is more consumed by evil thoughts than Ellsworth, wanting nothing more than to kill himself after all his dreams turned to ash? What is going on with the preachers? This is a strange supernatural tale dusted with the wounds war leaves behind, it is about faith and evil. Will Ellsworth be able to save them all with the help of his dear friend and Raphael? Should he trust in Raphael? Eerie and maybe not so beautiful a place, or is it? "It was as good a day to die as any. But first Ellsworth Newberry would have his morning cup of joe." Bellhaven, South Carolina. 1920. Ellsworth Newberry lost a leg in World War I, but that wasn't all he lost. He has lost his will to live. His wife is dead, as is their stillborn infant and he just sees no valid reason to live. But somehow he always stops before eating a bullet. Ellsworth realizes slowly that things are changing in his small hometown of Bellhaven, SC. For as long as he can remembe "It was as good a day to die as any. But first Ellsworth Newberry would have his morning cup of joe." Ellsworth realizes slowly that things are changing in his small hometown of Bellhaven, SC. For as long as he can remember, no one has ever dared go beyond the trees painted yellow in the woods. Too much darkness lurked there. Even evil, everyone said. In those deep woods there is a mysterious chapel with a 'healing floor'. Everyone who dares venture that far comes back at peace, seemingly healed of whatever was bothering them. They hear things that soothe their souls. Soon, they begin to crave more trips to the woods and the chapel, with the special clearing where an abundance of birds live and everything is always in bloom. Soon, though, Ellsworth notices, these very people are turning on each other, intent on harming those who have been their friends for years. It's the woods and the chapel, but no one wants to hear that and continue their visits to the 'healing floor'. The natural and the supernatural mingle in the woods and the town begins to fall apart. Ellsworth soon realizes he must forget his suicide attempts and overcome his fears to help his town face the evil in the woods. This book is indeed 'strange' as the title says. But it is captivating and completely draws the reader in. I believe this book would make a wonderful movie. The author has crafted characters that are not only believable but likeable and his plot is amazing. I recommend this one. Received this book from the publisher. All opinions are my own. I liked this book so much I read it about 10 times! But as the author, it was probably necessary! Holding true to form, I hurried to leave the first review. I hope everyone likes reading it as much as I liked writing it. And I thank everyone for the support! Cheers! 3 1/2 stars- The jury is still out on my final thoughts of this book. I loved Frank Perretti’s books but otherwise have not read a lot of supernatural stories such as this. I loved the setting in 1920. WWI had recently ended and life was still returning to a form of normalcy for many vets and their families in the US. The author does such an amazing job of transporting you to the story’s time period. It is so fun to read the dialogue and the unique phrases and sayings from back then. He clearly 3 1/2 stars- The jury is still out on my final thoughts of this book. I loved Frank Perretti’s books but otherwise have not read a lot of supernatural stories such as this. I loved the setting in 1920. WWI had recently ended and life was still returning to a form of normalcy for many vets and their families in the US. The author does such an amazing job of transporting you to the story’s time period. It is so fun to read the dialogue and the unique phrases and sayings from back then. He clearly does a great job of researching. His descriptions of the characters and their emotions quickly grab you and pull you into the story. This story was very intriguing. But it was also very unsettling. I would not call this a light read. It is a book that will keep you up late in the night with it heavy on your mind. It reminded me loud and clear that the human race is imperfect, even religious leaders that we so often put on pedestals and that God can use anyone to do His work. If you really enjoy stories with a strong supernatural bent then this is the book for you. The author clearly has an amazing gift for storytelling and definitely does a great job of evoking strong emotions with his stories. I received a copy of this book for free. I was not required to post a positive review and the views and opinions expressed are my own. Suspend your disbelief and enjoy the beautiful story telling in this historical fiction combined with the supernatural. We meet the citizens of Bellhaven, several of whom have returned to America from world war one with physical and psychological scars and injuries. The seemingly idyllic town has a hidden and troubling mystery lying in the depth of the woods. The characters were quirky and varied, I found myself egging on Ellsworth as the story builds. As much as I enjoyed the story, I did find t Suspend your disbelief and enjoy the beautiful story telling in this historical fiction combined with the supernatural. The characters were quirky and varied, I found myself egging on Ellsworth as the story builds. As much as I enjoyed the story, I did find the couple of chapters in the middle a little tedious trying to keep up with all the religious leaders and their churches in the town, however, the story all comes together following this and you just know that it's all coming together. I was fascinated and intrigued by the blurb and cover and was not disappointed. I went into this story not really knowing what to think about it. I knew from reading Markert's last novel with Thomas Nelson that this was likely to be some sort of analogy, one that was slightly weird and magical. Even the title confirmed the "strangeness" which would show up even within the first few pages in the form of odd characters and unnatural phenomena. But even with all that was strange about Bellhaven, the first part of the novel began slow, taking awhile to situate the reader in Ells I went into this story not really knowing what to think about it. I knew from reading Markert's last novel with Thomas Nelson that this was likely to be some sort of analogy, one that was slightly weird and magical. Even the title confirmed the "strangeness" which would show up even within the first few pages in the form of odd characters and unnatural phenomena. But even with all that was strange about Bellhaven, the first part of the novel began slow, taking awhile to situate the reader in Ellsworth's suicidal mind before even mentioning the chapel in the woods. And up until that point, I wasn't really wanting to continue with the story. It was only the mystery of the chapel, how it worked, why it was there, that kept me interested through the rest of the narrative. Even then, the pace was slow, with an entire chapter dedicated to leaving Ellsworth's thoughts in order to head hop between Bellhaven's plethora of religious leaders and delve into each of their inner sins. It was around this point that the religious nature of the story emerged, with the religions and denominations dividing amongst the tension pulling the town apart. It's also when Ellsworth's predestined role begins to come into play. I don't want to give away what happens or delve too much into the point this book was trying to get across. I'm not one hundred percent sure that I even understand what that point was. But I do want to say that I ended this book even more torn that I had with Markert's last. The mystery is engaging, the story weird enough to keep you guessing, but I'm not sure that I agree with the things the author was saying. Some of it, that not all things beautiful are good, were spot on while others... it's kind of difficult to explain without giving the story away. This story is weird. It's dark despite being set in a really bright place, with a narrative that takes its time delivering partial answers. Still, ignoring my confusion over the religious point, it was an interesting read with an interesting setting. Back last year I had to opportunity to review Angel’s Share which was a very different story and not 100% to my tastes if I’m honest. So it was with some trepidation that I started another book by the same author. I can gladly say the All Things Bright and Strange was a better storyline which engaged a lot more than the former novel. This tale focus on an usual chapel located in the woods along side a small town where some pretty odd things have occurred. Ellsworth Newberry is living the life of Back last year I had to opportunity to review Angel’s Share which was a very different story and not 100% to my tastes if I’m honest. This tale focus on an usual chapel located in the woods along side a small town where some pretty odd things have occurred. Ellsworth Newberry is living the life of a hermit after losing his wife and his leg dashing any hopes in his youth of being a professional baseball pitcher. When he visits the aforementioned chapel - peace seems to flood him and it becomes an addictive almost drug like quality. Heavy with supernatural themes - the story did tend to lose me a little toward the end but overall it was engaging and an interesting premise that different meanings from. Fans of Frank Peretti and Ted Dekker will find much to like here. 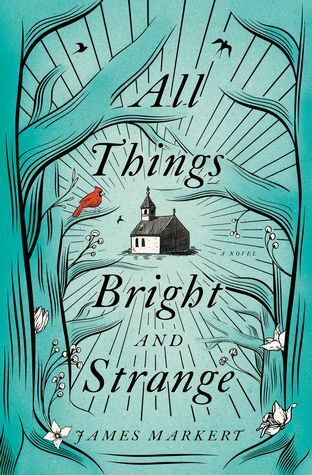 An interesting stab at mixing the supernatural with a religious foundation, All Things Bright and Strange is a little uneven but still enjoyable. I do find that the label of 'Christian Fiction' is a little misleading (and based on some reviews on Amazon, I see that other people feel the same way) because that label generally applies to the types of books where someone is grappling with some internal conflict and, through their Christian beliefs, they find their way. However, I find myself unable An interesting stab at mixing the supernatural with a religious foundation, All Things Bright and Strange is a little uneven but still enjoyable. However, I find myself unable to think of anything better, because the book does have a huge basis in the Christian religion. It is, however, really from a historical/scholarly standpoint. Also, this book (which is something I greatly appreciated) gives a strong sense of inclusion and acceptance of other races, religions, and people. There is no hint of superiority, but more of harmony—again, something I found refreshing and impressive. A little slow in some parts, and a little uneven in others—particularly where the POV switches (for the tiniest fraction of the novel) suddenly to that of several townspeople for small snippets of narration at a time, like a point-of-view wheel—the reveals and the unfolding of the plot were intriguing. As a Southerner, I found Markert's turns of phrases to be spot on, and they often made me giggle with their authenticity. A very interesting and absorbing book. I really enjoyed the characters and the interesting plot elements. Of course I like books with religious themes that are not didactic. This book does a great job of it. Great audiobook reader on this one. Started out strong and ...went on too long. I was attracted to the premise of James Markert’s new novel and it turned out to be much more than I expected. In fact, it’s a novel of biblical proportions. The main character, Michael Ellsworth Newberry, has just returned home to Bellhaven from WWI, with one less leg and a load of guilt and heartache. He is still grieving the death of his wife and the loss of his lifelong friend, Calvin. Ellsworth is at a crucially low point in his life, when he sees a female cardinal that causes him to rethink I was attracted to the premise of James Markert’s new novel and it turned out to be much more than I expected. In fact, it’s a novel of biblical proportions. Ellsworth is at a crucially low point in his life, when he sees a female cardinal that causes him to rethink the path of his life. The cardinal is a symbol of the fire of life that burns within, a symbol of joy, hope and rejuvenation. To Ellsworth, the cardinal symbolizes his late wife, Eliza. As Ellsworth slowly emerges from the depression he is in, he realizes the people of Bellhaven have begun to go into the woods. Woods that for years had been off limits. Within these woods is a chapel that is believed to have a “healing floor” and some people claim to hear the voices of their loved ones who have passed away. The chapel has a pull on the people, much the same as an addict craves his drink or drug of choice. We all know the saying, “too much of a good thing is not good for you” and “things are not always what they seem,” which holds true for the chapel. Ellsworth had his suspicions about the woods and the chapel and soon his suspicions were confirmed. Gathering a trusted group of friends and newcomers, Ellsworth and the townspeople work together to fight against an evil force that lies in the center of the chapel. I think readers with a knowledge of the Bible will catch the foreshadowing, the significance of names and possibly have a better understanding of what is to come. I thought the story was a gentle reminder that we are all connected and need to care for the living and not dwell too much on the past. Many thanks to NetGalley and Thomas Nelson-FICTION for providing me with an advance read in exchange for my honest review.